Can’t make it to Sochi 2014? Not to worry. There are over 20 UBC experts available to comment on the Sochi Games, from security to sports science at: http://news.ubc.ca/2014/02/04/story-ideas-and-experts-for-the-sochi-games/. Find Games-related experts, Q&As and feature stories about UBC people going to Sochi; Russia; Athlete health, sport medicine and doping; Sport psychology; Sustainability and the Games; Games impacts; Law and society; and, the Paralympics. Re-live the Vancouver 2010 Olympics via cIRcle, UBC’s Digital Repository! Explore the cIRcle 2010 Olympics Project which preserved UBC’s intellectual output related to the Olympic and Paralympic Winter Games. Highlights include conference webcasts and other events, research, and coursework. Stay tuned for… The Vancouver 2010 Olympics’ Intellectual Muscle podcasts in cIRcle soon! The Olympic Games Impact (OGI) reports covers the pre-games and post-games’ studies including their results, lessons, and the technical report. Find all of them and more in cIRcle, UBC’s Digital Repository. Explore the UBC and the 2010 Olympic and Paralympic Games community at: https://circle.ubc.ca/handle/2429/17995. Winter Olympics materials on display in time for Sochi! And online resources for your classroom. January 22nd, 2014 by elena | Comments Off on Winter Olympics materials on display in time for Sochi! And online resources for your classroom. 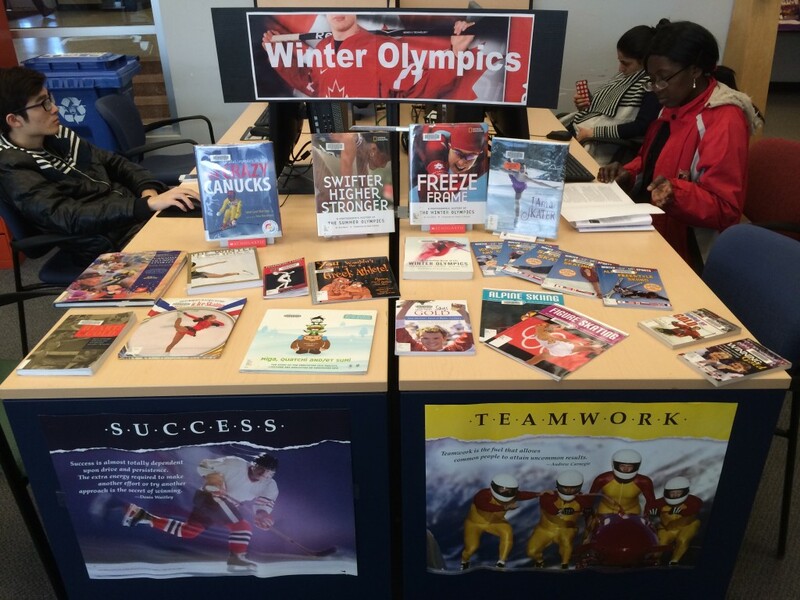 UBC Education Library has a great display on now of curriculum materials for teachers and books for children on the Winter Olympics. Posted in display, New in the Library, olympics | Comments Off on Winter Olympics materials on display in time for Sochi! And online resources for your classroom. Now seems like a good time to look at government sources of information regarding the upcoming winter Olympics. There is an impressive array of information freely available on the web from government sites: reports, contracts, statistics, financial accounts, media releases etc. 2010 Winter Games Secretariat: From the BC government this site is a rich source of BC Government press releases, reports, business plans/budgets and contribution agreements between government(s) and venue providers! Latest news releases are available on the homepage or you can take a look at the entire archive of releases here. Annual sustainability reports from 2005 onwards and sustainability resources. Business plan and budget from 2007 as well as the update d budget from 2009. Media Centre with links to Vanoc news releases, image gallery and backgrounders. Link to Vanoc commissioned report: Legacies of North American Olympic Winter Games: Lake Placid; Calgary & Salt Lake City. Fact Sheets covering topics such as Aboriginal Participation, Sustainability, and Security. Key Documents: such as Multi-Party Agreement; Bid Books & other related reports from various government departments. The online Atlas of Canada from Natural Resources Canada has recently added a theme page covering the upcoming 2010 Olympic games. “In advance of the 2010 Winter Olympics, the Atlas of Canada is pleased to provide to the public a special series of maps on the following themes. Maps come with extensive documentation explaining various map features. The site also includes articles on Olympic medalists, winter sports, the geography of the Vancouver games region and physical activity.